Provided photo Edith Edsall celebrates her 100th birthday with family and friends on Jan. 12 at Dorothy Love Retirement Community in Sidney. SIDNEY — In spite of the inclement weather, family and friends of Edith Edsall gathered at Dorothy Love Retirement Community in Sidney Saturday, Jan. 12 to celebrate her 100th birthday. Her actual birthday was Jan. 8. Edie, as she is known to most, enjoyed many years in Piqua as a seamstress and hospital volunteer while raising her family and helping to supply family, friends and drive-by customers with produce from a large garden. She was married to her late husband, Les, for more than 75 years. Her three children, five grandchildren and families, other relatives and many friends and customers shared in her celebration. 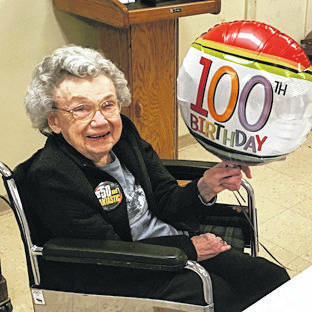 https://www.dailycall.com/wp-content/uploads/sites/30/2019/01/web1_Edsall.jpgProvided photo Edith Edsall celebrates her 100th birthday with family and friends on Jan. 12 at Dorothy Love Retirement Community in Sidney.